Hance Chapel is a great venue, located on the SE corner of the TTU campus. And Matt says Dr. Strauss will be excellent. Here’s why I believe Mat…. 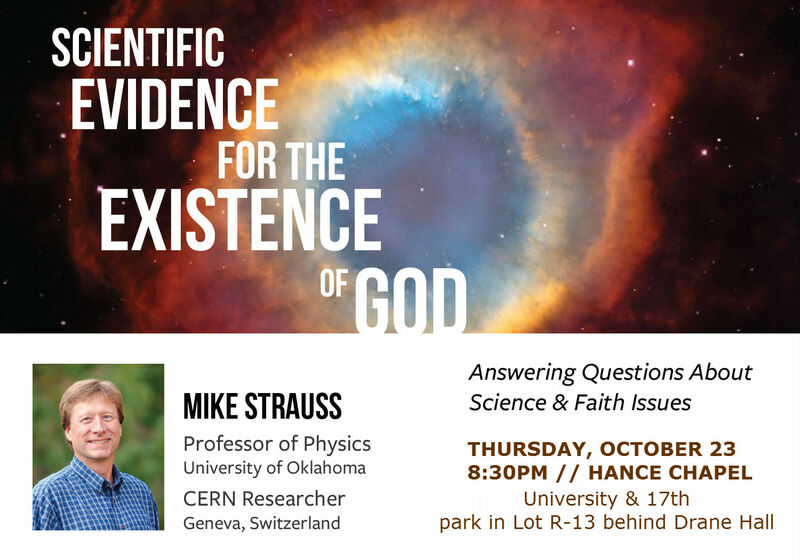 NOTICE the “CERN Researcher” title under Dr. Strauss’ name. Google that. CERN is the European Organization for Nuclear Research located in Geneva, Switzerland. The center boasts the largest “particle accelerator” in the world. This is where scientists are trying to discover the “God Particle” in one of the accelerator’s called the Large Hadron Collider (LHC). Should you not have a conflict, I believe both Christians and non-Christians, alike, will enjoy hearing what Dr. Strauss has to say. Always keep in mind: we can’t “prove God’s existence in a laboratory.” (Because of the role of faith in Christianity, I happen to believe God intended it that way.) However, the evidence for His existence is overwhelming.